Comfort Fit: This Basic 14K Two-Tone Yellow and White Gold 1.5mm Solid Figaro Pave Chain Necklace will fit comfortably on the neck.Get everyone to compliment you on this beautiful necklace, Can be worn with or without a pendant Full dimensions: 1.5mm Multiple chain lengths available-16",18",20",22",24",26",28"30"
SAFE FOR ALL SKIN TYPES: All Pori Jewelers necklaces are hypoallergenic and nickel free so they are safe for all skin types. If you have sensitive skin, you will love our product. 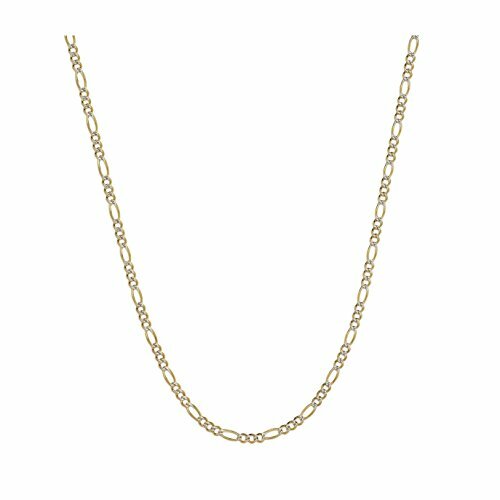 These 14K Two-Tone Yellow and White Gold 1.8mm Solid Figaro Pave Chain Necklace are a perfect piece for any women, can be worn with any outfit or any occasion. 100% SATISFACTION GUARANTEE! - Our absolute 100% no-questions-asked, you'll-totally-love-it-or-you-get-all-your-money-back guarantee. We think you will LOVE your 14K Two-Tone Yellow and White Gold 1.8mm Solid Figaro Pave Chain Necklace ; however, we want you to be happy with your purchase! If there is a problem with your product we would love the chance to make it right.